Coffee speciality stores: a paradise for connoisseurs and a nerve-racking ordeal for the novice. Will you buy Colombia, or should you try Ethiopia instead? Should you stick with Arabica, or buy a nice Robusta blend? Decisions, decisions; we know it’s hard, but it matters. Keeping it simple, perhaps, what matters most is the roast level of the grains. Roasting coffee beans creates the flavors and aromas we love in coffee and knowing what’s your favourite roast will give you at least an idea of what you can expect from it. We roast coffee because we want to free the oils, aromas and flavor compounds trapped within the green beans. All the toasty goodness happens in the oven so, let’s take a closer look. Green beans, all clean and tidy, are added to a roasting oven that can vary in size, from an 8-ounce home roaster to a professional 300 pound one. The secret of a good roast is keeping the beans in movement, so these instruments have mechanical, rotating parts comparable to a mill. 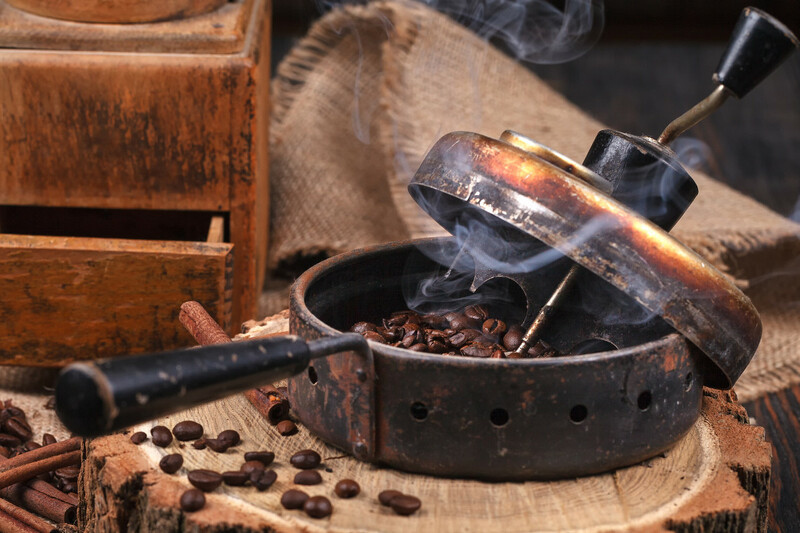 Coffee beans are roasted evenly with fast-rising temperatures that can go as high as 482°F. The beans reach their “first crack,” or the moment they expand, when their internal temperature reaches 356°F–401°F. From there, it’s up to the master roaster to decide how dark he wants to go. If you stop soon after the first crack, you’ll achieve a light roast. If you allow the beans to reach 410°F to 428°F, just before the second crack, you can call it a medium roast. Around the second crack, at 446°F, you get a medium-dark roast. From there you get deeper and deeper coloured, intense, dark roasts. Technicality aside, different roasts are called with several names, depending on the country. Light roasts are labelled Light City, Half City, and Cinnamon toasts; medium roasts are often found as American, or City roast; Full City and Vienna style roasts fall into the medium-dark category, and French, Italian and Espresso roasts are the darkest of them all. The roasting level does not only change the names in the bag, but the flavors and aromas expected in your mug. Light roasts deliver fruit aromas reminiscent of the coffee cherry mixed with hints of toasted grain. You get a sense of the place from where coffee was grown. Subtlety is the norm, but don’t be fooled by the colour, light roasts have more caffeine than darker ones. Medium roasts show the first notes of the characteristic toastiness we love. These roasts are well balanced as they are blessed with the best from both realms. Medium-dark roasts create robust coffee with hints of caramel and toast, while darker roasts are just full-on. Drip over coffee makers like a Chemex benefit from lighter roasts while espresso machines and vacuum coffee makers perform better with darker roasts. Try both, light and dark roasts side by side. Really, take a minute to find which one makes you giggle. You’ll be confident enough to move on to the next level and will be selecting coffee like an expert in no time.